Mr. Bill was adopted by Catherine and Paul. They write, "Mr. Bill was living in a feral colony in Billerica when Kitty Angels volunteers trapped him and socialized him. He came home with us in October 1998, at age 2. He is the sweetest, funniest cat - a genuine 'clown.' When he was at the Nashua Petsmart waiting to be adopted, the sign on his cage noted, 'Mr. Bill LOVES his toys.' He still does! Lately he has taken up adding his own tail to his collection of things to be chased. He is my little shadow and gives the best (if also strongest; he's a big boy!) head butts. He sleeps curled up on my pillow every night and purrrrrrrrrrrrrrrs until he goes to sleep. 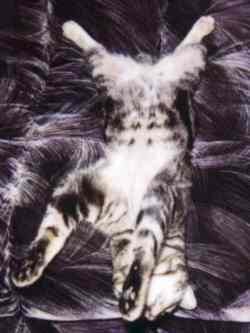 "We are grateful every day to Kitty Angels for bringing Bill into our family. We can't imagine life without him. Thank you from us and from Mr. Bill for all the good work you do for other kitties in need." 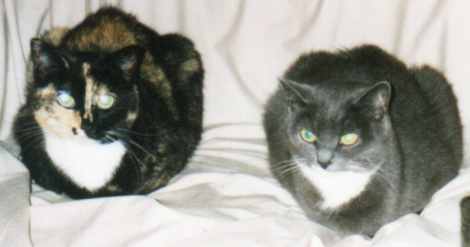 Marie adopted Splash (left) and Misty (right) in 1996. She says they have a great time sleeping on the sofa all day! 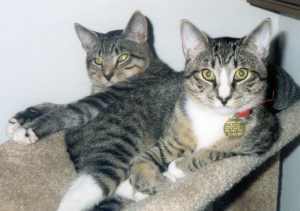 Worthy (left) and Journey (right) were adopted by Michelle and David in November 1998. They were feral kittens living under a mobile home. At the time Kitty Angels found them, they were very scared but now they've become quite social and are making themselves at home. Chewbacca was adopted in November 1998 by Kath-e and Jerry. Chewy writes: "I usually lay this way when I come upstairs in Mummy's living room. She thinks it looks pretty cute (sometimes it doesn't take much to entertain her!!) Daddy finally came home from his trip and he thinks I am pretty handsome too. Please take care of my other friends at Kitty Angels. I hope they are as fortunate as I am in getting a really neat home!!"